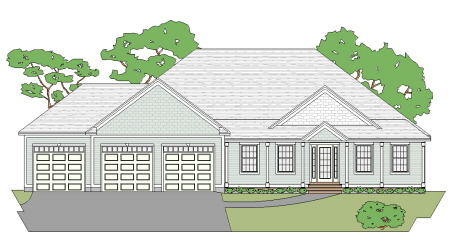 This 3 bedroom country ranch home plan offers a full length porch across the front and a 2 car garage. A nice entry foyer leads into an open concept living area with a tray ceiling. The kitchen has a large pantry, and the living room has a fireplace. A formal dining area, equal-sized kid's rooms,a master suite with a large walk-in closet and a master bath with claw foot tub round out this popular floor plan. Stairs lead to the full basement from the 2 car garage eliminating the need for a bulkhead. This version of our MP ranch series 3 bedroom country ranch home plan is a reversed version of the Samoset A above with a steeper pitch on the roof. 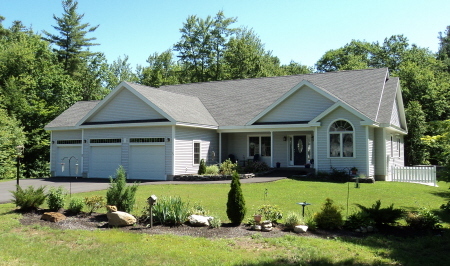 It offers the same amenities as all the rest in the series which includes a full length porch across the front, a 2 car garage, a nice entry foyer leading into an open concept living area with a tray ceiling a kitchen with a pantry, a living room with a fireplace and a formal dining area. It has two equal sized kids' rooms and a great master suite. This 2 car garage has storage or an optional room above. This attractive hip roof version of our MP ranch series 3 bedroom country ranch home plan offers great curb appeal along with the same amenities as all the rest. 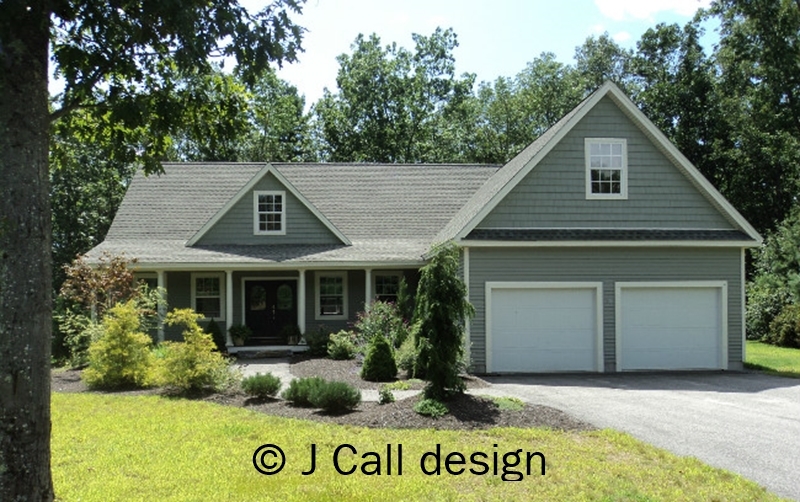 It has a full length porch across the front and a 2 car garage. A nice entry foyer leads into an open concept living area with a tray ceiling, a kitchen with a pantry, and a living room with a fireplace. The same equal sized kid's rooms, and formal dining area. The master bathroom has a different layout, and it has a 3 car garage with our popular cellar entry instead of a 2 car garage. This beautiful version of our MP ranch series 3 bedroom country ranch home plan just shines with curb appeal. It has all the same amenities as the rest like a covered porch; a nice entry foyer leading into an open concept living area with a tray ceiling; a kitchen with a large pantry, and a living room with a fireplace. The twin bedrooms are still the same size but the front one has a sitting area bump-out. The master suite has a different closet and bathroom arrangement from the other plans in this series. 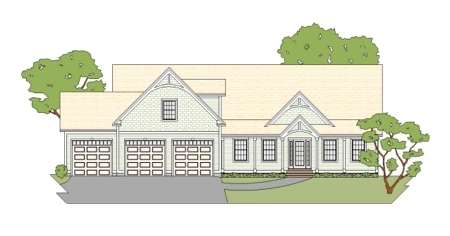 This floor plan also has a 3 car garage with our popular cellar entry instead of a 2 car garage. This beautiful version of our MP ranch series 3 bedroom country ranch home pan looks more like a modern cape than a ranch. In addition to having all the same amenities as the rest like a covered porch; a nice entry foyer; an open concept living area with a tray ceiling; a kitchen with a large pantry, and a living room with a fireplace; twin bedrooms the same size, the master suite has a handicap accessible bathroom. This floor plan also has a 3 car garage with our popular cellar entry instead of a 2 car garage, and a large room above that can be used as you choose. This version of our MP ranch series 3 bedroom country ranch home plan also looks more like a modern cape than a ranch. It has all the same amenities as the rest of the series like a covered porch; a nice entry foyer; an open concept living area with a tray ceiling; a kitchen with a large pantry, and a living room with a fireplace; twin bedrooms the same size, and a great master suite. This floor plan also has a breakfast area bump-out sun room, and a 3 car garage with our popular cellar entry instead of a 2 car garage, and a large room above that can be used as you choose. This is a larger version of the Samoset F above. 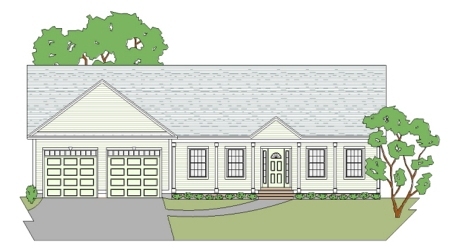 This 3 bedroom country ranch home plan has all the same amenities as the rest in this series like a covered porch; a nice entry foyer; an open concept living area with a tray ceiling; a kitchen with a large pantry, and a living room with a fireplace; twin bedrooms the same size, the master suite has a handicap accessible bathroom. This floor plan also has a larger 3 car garage with our popular cellar entry instead of a 2 car garage, and a large room above that can be used as you choose.